What Is the Difference Between Push & Pull Marketing? Do you know the difference between these two techniques for online marketing? Offering two different approaches for new business to reach new customers, push & pull marketing are both powerful ways to boost sales. However, they both take very different routes to get there. Do you know one from the other? Here, we take a quick look at the difference between push & pull marketing and how SEO plays an important role in helping you make your online advertising go further. Push & Pull Marketing: What’s the Difference? Quite simply, the differences between these two tactics for generating new business is all about how the customer is approached. What is Push Marketing & Some Examples? Push marketing is probably the most common and traditional way that most of us will be aware of advertising. It is a term used to describe the process of placing your products in front of the customer when they are not actively looking, usually via promotional materials. Push Marketing can be very powerful but often requires a big budget. In offline sales, this kind of marketing can be seen when you get leaflets delivered to your door, advertising on the television or via magazines/newspaper and with careful placement of billboards. Online, push marketing could be used to describe similar styles of advertising such as banner ads, email campaigns and pop-ups. Push advertising works by using attention grabbing copy, eye-catching images and tempting ‘hooks’. The theory is that by putting a product in the mind of the customer, it will make them want it. It is often the primary way that many businesses believe that marketing should be done. Fundamentally, online push marketing is about ‘interrupting’ potential customers who aren’t actively looking for you or your products. In this way, the required ‘reach’ to convert your audience is a lot wider than via the alternative. A good example of push marketing in the online world, would be Facebook ads. In this scenario, the user may be browsing Facebook in their leisure time and see an advert targeted at them by a local business offering a product or service relevant to them. The user may disregard the advert, but it will continue to show in their news feed continually reminding them about the product or service. The hope is that the user will eventually click the ad and take an action. Put more bluntly, push marketing is not the most cost-effective form of spending when it comes to online advertising. What is Pull Marketing & Some Examples? On the other side of the coin, we have pull marketing; a technique that is designed to entice a customer who is actively looking for your product, service, brand or company using more subtle methods. Pull marketing is extremely powerful at leading customers to your brand…as long as there is a demand. In traditional advertising, this kind of low-key technique can be seen with corporate sponsorship for big sporting events, product placement and native advertising in media like trade journals and magazines. You can find examples of online pull marketing though strategies such as SEO (organic) or PPC (sponsored), which place search engine listings in front of the user when they are searching for you. 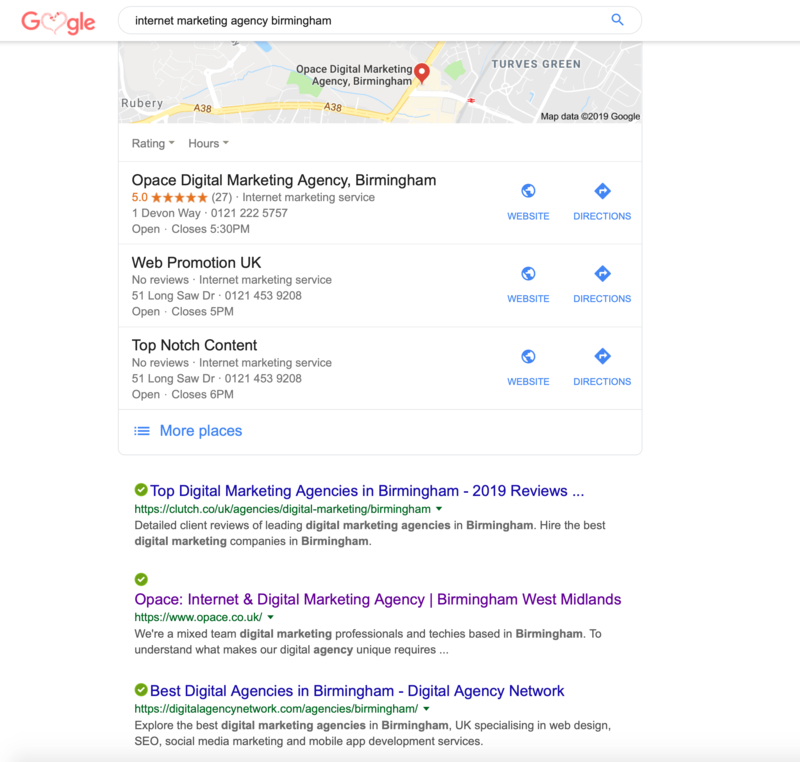 Below shows two of our own listings (one organic SEO and the other a Google My Business listing) which aims to pull users searching for a very relevant and localised term, “internet marketing agency birmingham”. Compared to push marketing, these kinds of tactics are far less intrusive and work ‘behind the scenes’ to create awareness of a brand or product and enable your company to be found when the demand is there. Push & Pull Marketing: Which is Better? There are a lot of pros and cons to both techniques when it comes to advertising your business and products online. Far too many to go into in this short piece but ultimately the decision between the two depends a lot on your budget and the kind of services or products you are selling. For companies that offer something that is in high demand then pull marketing is often enough on its own. If, however, you have a brand new product that nobody knows anything about then push marketing will be far more important…at least to begin with. What is true is that a combination of both methods will produce good results when executed correctly. However, it is widely acknowledged that, with the low cost of online marketing when it comes to SEO, pulling your customers is far more cost-efficient than trying to push them. Pull your customers using SEO. Pull marketing can be achieved easily through SEO and relies on producing a comprehensive and targeted digital marketing strategy. Using a combination of PPC and paid advertising, content writing, blogger outreach, SEO and social media, you can achieve big gains in traffic flow to your website and tangible results in conversion. There are plenty of ways that SEO can help deliver the goals of your online advertising campaign and Opace is well placed to take care of this for you. A dynamic and creative digital and internet marketing agency with passion and experience, we would love to know more about your marketing ambitions so contact us today to find out how we can help you achieve them. Image Credits: pxhere, pxhere, Matt Madd (Costculator)/Flickr and SEOFreelancer/Flickr.